Motor and uStepper PCB is not included! Please read the stepper motor requirements below! 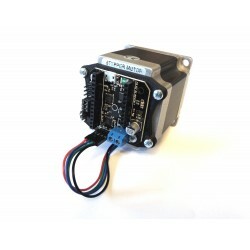 uStepper is capable of delivering up to 2A at 30V (24V recommended) which is sufficient for many NEMA 23 stepper motors. uStepper was originally designed for NEMA 17 stepper motors, but this conversion kit allows you to mount the uStepper on a NEMA 23 stepper motor to get all the features of uStepper on your projects requiring a little more power! 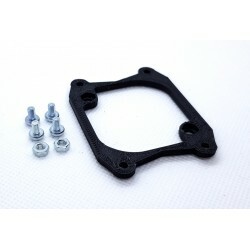 The NEMA 23 mounting kit is developed to fit most NEMA 23 stepper motors, but since there is a variety of motors on the market we here list the measurements of the motor for which this kit is designed. On the back of the NEMA23 there should be 4 holes spaced 32mm on one side and 51mm on the other side (center to center). These four holes should be M3 and with a depth of 1.8mm. 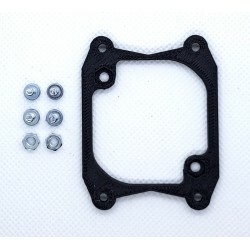 The center hole on the back (for the encoder magnet) should be 10mm in diameter and the shaft should be aligned with the bearing giving a depth of approximately 4mm.